Now on the ferry waiting for it to sail.Traveled to Zeebrugge via the Strepy-Thieu boat lift. We started in France and drove though Germany, Luxembourg and Belgium to reach tonight's accommodation, Its located just outside a small village so it's a good job we have booked the evening meal. After a leasurely breakfast the car was packed and we were ready to set off by 10:00am. The first stop was the boulangerie for bread for lunch. The most direct route to the Alsace would have been via Switzerland however that would have required the purchase of a carnet to drive on the Swiss motorways. We opted for the slighly longer journey by staying in France and saved the £30 cost of the pass. 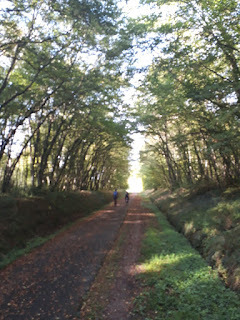 Our route took us back towards Grenoble and then towards Lyon before turning off on the peage towards Strasbourg. The journey was around 5 hours 30 minutes . We had considered breaking the journey with an additional nights accomation but decided on an additional night in Ribeauville instead. The drive was uneventful. The driving was shared and punctuated by a Brexton lunch and coffee stop . Kate soon stopped trying to direct us via Switzerland and routed us via France. On reaching Ribeauville to get to the accommodation we had to drive up the main semi pedestrianised street avoiding the tourists.We were able to park outside the house to unload. The we retrieved from the key safe and having initially opened the "coal shed" found the correct door. The accommodation has 3 floors. The kitchen and lounge is on the ground floor. Bedroom 1 and a bathroom and shower is on the 1st floor and bedroom 2 with its own on suite is on the top floor.The car had to be parked in a public car park on the outskirts of the town about a 5 minute walk away. The "coal shed" was a real bonus as it provided secure storage for the bikes. We eat out in a restaurant in town. S'Rappschwirer Stebala was eventually selected and we all selected a set 3 course menu for 19.90 euros pp. The main of chicken with mushrooms in a Riesling sauce was particularly tasty. Ribeuuville is a medieval town with a centre full of historic buildings and lots of tourist shops Louise.Marked cycle paths on the outskirts of the town should provide to opportunity for some cycling. 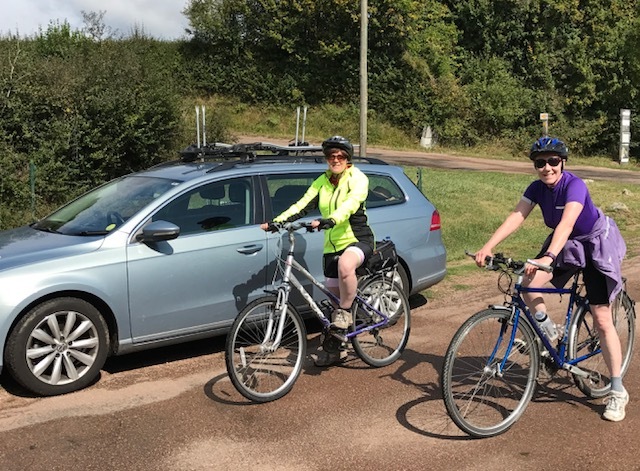 The accompation in Allemont was picked to provided the opportunity to cycle up one of the Tour de France's classic climbs. So it was that at 8:15 on a Tuesday morning I set off from our gite. I had planned the route at home. A 54 mile ride from Allemont that included the classic climb was programmed into the Garmin. The forecast for the day was temperatures in the mid 20's but it was a cool 10.2 degrees when I set off. My route took me down to the main road which I then followed for for about 4 miles to Le Bourg d'Oisans where I turned towards Alpe D'Huez. The 13.8 km climb with 21 hairpins and 1124m of ascent has made tour champions and broken the hearts of others. The unofficial record is 37 minutes and 35 seconds by Marco Pantani set during the 1997 tour. My progress to the top was at a more leasurely pace and I would have finished about an hour behind him! The ski station is above the village of Huez and once you reach the village you still have another 5 km of climbing to reach the top. Photographers on route snap your photo as you pass providing the opportunity to purchase a momento. There appears to be a couple of "finishes ". The first by a bar is the top of the time climbed whilst signs point to the official tour de France finish a little further on. 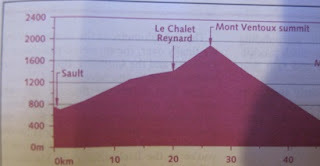 Photos taken then rather than descend my route took me higher to just below 2000m and the Col de Saranne. For some reason my Garmin GPS did not want to take me on the road and then frooze.The descent to Clavans le Haut was steep with bolders littering sections of the road. My original route was to take the minor road just after the resovoir at Mezion, but with the Garmin frozen I missed the turn and continued on the main road towards Le Bourg d'Oisans. Fortunately the 2 short tunnels were lite but I would take lights on a future trip.Rather than take the main road back to Allemont I turned off and climbed up towards Alpe D' Huez for the second time. This time I turned off on reaching Huez to the Col de Poutran. The minor road offered some excellent views across the valley and then down to Allemont. I arrived back just after 3:00pm. A excellent ride of 53.7 miles with 2452 m of ascent. After a short ride with Lyn around the lake we eat in the gite. Oven roasted duck breast followed by mini crepes cooked on the mini crepe maker that was in the accommodation. The Cluedo came out and Louise showed off her detective skills once we had translated all the weapons into to English. We slept in the boat yard overnight and the white ninga arrived with coffee at the normal time. Roger took the opportunity for the last run of the holiday and set off along the canal tow path with Louise following by bike. The boat was emptied and car packed. Gerry , Chris and Roger were planning to get the train just after 10:00 to Clamecy about 8 miles away to catch their connection to Auxerre and then onto Paris. The train was being replaced by a replacement bus service and we were intending to wait until they were safefly on board. We decided to drive them to Clanamcy instead it was only when we asked if we could leave some cases on the boat whilst Robert drove them to the station we were told there was a rail strike. The receptionist checked the website and fortunately the 12:10 was still running. Robert drove them to Clamency found the train station and dropped them off in the centre of town where they enjoyed a coffee and mini croissants while waiting for the train. Robert returned to the boat yard to find Lyn and Louise inspecting the Horizon 3 boat that was moored along side us. It was more upmarket than the one we had hired and included front and rear thrusters. Something for a future trip? 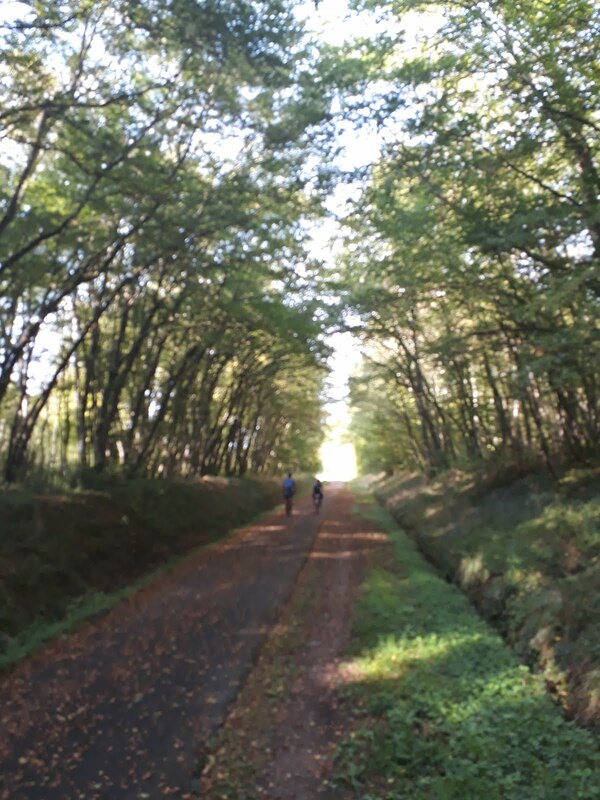 We decided to follow the Canal de Nivernais a little further south and went for a short bike ride up the Sardy staircase locks and it's 16 chambers. Louise was tempered by a crape for an eastern themed cafe in one of the old lock houses . However after a closer inspection of the premises we decided to move on. Perhaps it was the collection of dolls laid out around a base of a tree combined with the general state off the premises. The clouds darkened as we cycled back but we were fortunate and missed the rain. We reached the car and had a Brexton lunch instead. We then drove to the accommodation stopping on route for provisions . We arrived just before 17:00 and were meet by Jean-Pierre. He gave us a comprehensive tour of the apartment and some of its history. He had spent 18 months refurbishing the tower and had done a lot of the work himself. It had been done to a high standard and without some of the restrictions of UK building regulations. He was proud of what he had achieved and then went on to show us around his house. We were not expecting any food but he gave us some bread, pain au chocolat and fresh honey from the farm. We declined the escargots from the farm. The evenings tea was roast pork with garlic served with Apple sauce. We were late putting in to cook because of the length of our tour but the wait was worth it. Our last full day in the boat. By now we were in a routine. Roger set off on his morning run accompanied by Louise. Chris sent for at bike ride accompanied by Gerry whilst Lyn and I had breakfast. Everyone was back by 9:00 and we all set off to explore Clamency. Lyn and I by bike and the rest on foot. We meet at the church on top of the hill. Bread was purchased for lunch and and for sandwiches for Gerry, Roger and Chris's train journey to Paris on Saturday . The excellent butchers in the centre of town provided some freshly minced beef for tea. We were all back at the boat and on our way by 10:00. We pulled over and let boat that followed us out of the mooring past as they were traveling faster than we were . A good move on our part as we caught them up at the first lock. It turned turned out it was being crewed by a Russian couple and their children who have lived on Germany for the last 10 years. We had to wait about half an hour for the lock keeper to arrive. He arrived by moped with a lit cigarette in his mouth and apologised and said he was having to man the next 3 locks. The boat that overtook us was in first had had to ensude the additional current from being nearest to the lock gates. We made it though the next 4 locks before mooring for lunch. A European kingfisher provided a photo opportunity before we moved on when to get to the next lock when it opened after lunch. For the remaining locks back to Tanay they squeezed 3 Le Boat boats onto each lock. We arrived back at the base just after 4 pm to spots of rain but not enough to warrant wearing waterproofs. The side thrusters proved usefull as Robert reversed the boat onto the base . We had planned a wine tasting and took the car up the hill to Tanay.We found the winary but it was closed so we returned to the boat to prepare spaghetti Bolognese for tea. Another excellent meal. The last of the wine was finished but we have been left with some beer.